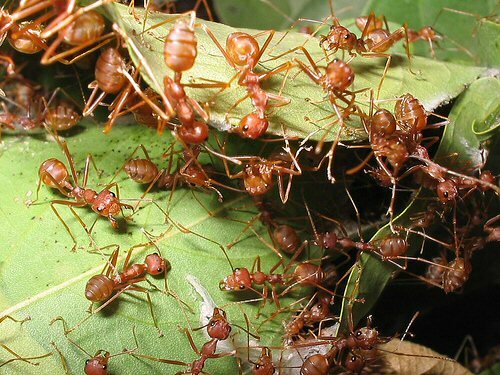 Silicon is the "army of ants", to quote Professor Hajimiri! Silicon is so cheap you could shingle your roof from it, and maybe some day you will, in order to power your house with PV cells. Silicon comes in 12 inch (300 mm) and larger wafers. Processing is cheap. But it is not a good media for microstrip (lossy), and it is not rad hard. Noise figure, power, are all second class to any of the compound semiconductors. It can only operate reliably up to 110C, but silicon is an pretty good heat dissipater. Laterally-diffused metal oxide semiconductor technology, used to make power amps. The Freescale web site claims they pioneered the technology. Can withstand 200C channel temperatures. Good to 3 GHz, 10 watts. Here's a separate page on silicon LDMOS! SiGe is a new development (in the last eight years), and was originally predicted to put all forms of GaAs into the history books. SiGe can make very cheap parts, with performance maybe into millimeterwave, with production processing on eight-inch (200 mm) diameters wafers. But the devices are not as high-performance as GaAs, in terms of noise figure and power. The setup charge to make a mask set is enormous, because 200 mm contact masks are needed (GaAs usually uses a 10X wafer stepper, these glass reticles are relatively cheap). You might pay $250,000 for that first SiGe wafer, but your one-millionth amplifier will be oh-so-cheap! The poor insulating properties of a silicon substrate means it's not a good media for microstrip, so you have two choices. You can make transmission lines in the backend of line (BEOL) SiO2 and metal layers. The SiO2 dielectric layers are thin, which means high metal losses. Or you can send your wafers to a third party for post-processing to put a lower dielectric metal system on top of it, such as benzo-cyclo-butene (BCB) and gold. Every time the upper frequency of SiGe extended, the breakdown voltage is reduced. Some of that stuff has to operate at 1.0 volts, which means forget about all but the most girly-man of power amps. Low Vbr, as bad as 1.5 volts for IBM "9HP"
- 5th Generation (IBM 9? 350 GHz HBT) so far this platform is only a rumor!